I'm a winter person, however once the spring season starts approaching I get so excited because I love the fresh flavors and the smell of grills in the neighborhood and fresh cut grass. Ah, and rain too - I love the smell of rain this time of year. With the start of Spring tomorrow I can't wait to break out our trusty grill (after learning how to check the propane levels) and start firing up some burgers, grilled chicken, fruits, veggies and pizzas! In preparation of spring I've been experimenting with burger recipes on my indoor grill trying to find the perfect recipe. 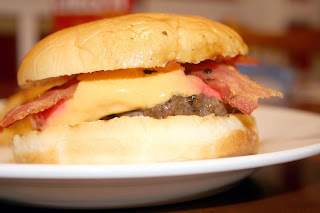 In my opinion, the perfect burger is one that can be adapted with a few subtle changes to the basic recipe because let's face it - sometimes you want it a little spicier, a little more earthy, etc. I love to add flavorful herbs and spices to a burger to compliment the rest of the meal, or to just add a kick! In a large bowl, mix together the beef, yellow onion, garlic, 1 teaspoon salt, 1/2 teaspoon pepper and Worcestershire sauce. Form the mixture into 4 patties, each 3⁄4 inch thick. Liberally coat both sides with remaining S&P. During the last 2 to 3 minutes of cooking, toast the hamburger buns, cut side down, on the grill. Serve the hamburgers on the buns with desired toppings and condiments.